own forever home. He should not have to share his time. bunny girls out there, you do need to adopt Jackson as soon as possible. promise that you won’t be disappointed by his charm. Thanks to fostermom Corrina for writing this blog. I am always contructing bunny toys (as well as buying overpriced, expensive ones). 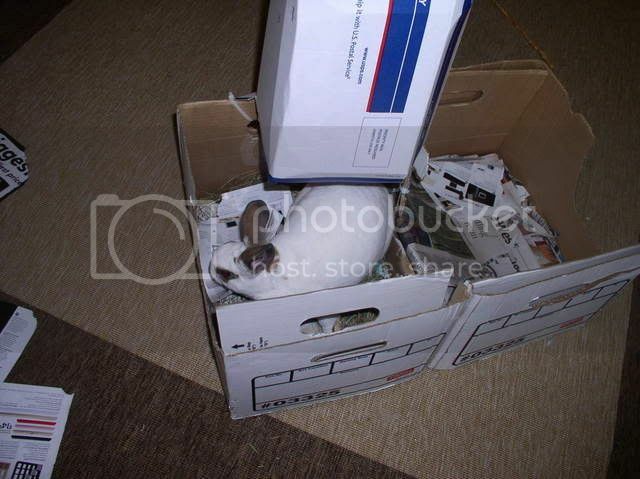 My latest project involves 2 document boxes, 1 ebay small-medium shipment box, zipties, some newspapers, and hay! First – I stuck 2 boxes together with zipties, broke down the middle barrier, ripped some holes on the ends for easier bunny entry. Last, I tossed the newspaper in. There is much shredding-goodness! This weekend Matt and I finally rejoined the ranks the the rabbit fosterers. We also brought home Cheyenne, who will be living with us permanently as a sanctuary bun since she is now almost completely blind. Our two new foster-buns are Tatum and Winona. Tatum is currently being given antibiotic ointment for conjunctivitis so she has at least 3 sessions a day of ointment application and snuggling. (The snuggling is to keep her occupied for 10 minutes after putting the ointment in so she doesn’t just groom it off. But she also really loves to snuggle, so this is no hardship.) Last night while we were snuggling, Tatum decided to groom my face. I was so thrilled. Tatum is a real sweetie and I am really looking forward to finding her a good home. I hope we’ll be able to find an adopter for her who already has a rabbit and is looking for a companion. Tatum would dearly love to have a friend. While Tatum was getting her medicine, Winona got to run around and play in the giant pen we’ve set up. Watching Winona move around the pen confirmed her new nickname in the household; Mz. Muppet. She’s got a very expressive and distinctive face, but her loose-jointed way of moving really makes her look like one of Jim Henson’s better creations. Winona is very social, gentle, and affectionate. Though more active than Tatum, she’ll still happily stretch out in your lap for some attention. When you scratch between her ears and down her jaw, she tooth-purrs. Her purr is louder than any bunny I’ve ever met before, it sounds like a pair of castanets! Like Tatum, I am looking forward to finding a loving adopter for her. She’s such a sweetheart and she really deserves a good home with people who will enjoy hanging out with her. After the foster-buns had been settled in for the night, we went upstairs to spend some time with our own buns. We offered our terrible trio (Beanbag, Lookout, & Echo) a bit of romp time but they weren’t feeling very active and quickly retired to their cage. Since the trio opted out, we decided to give Cheyenne her first chance to expand her knowledge of her new home. It was completely fascinating to watch her “map” her surroundings. When she was first put down, she slowly sniffed the area and walked around bumping into things to figure out where they were. Cheyenne walks with all 4 feet when she’s first exploring an unfamiliar environment. Sighted rabbits don’t normally just walk one foot in front of the other; when moving slowly most rabbits still hop with the hind feet and walk with the front. (Once they speed up, they gallop in a fashion very similar to their close cousin the horse.) You could see through the pattern of where she went that she was creating landmarks in a mental map. Every time she re-confirmed the location of her landmarks, her movement between the landmarks would become more confident and natural. Eventually, she knew how enough of the space was laid out that she could move around it almost as naturally as a sighted bunny. It was incredible to watch her creating a mapping algorithm. I’m very curious to see if she will remember the map 24 hours later. Lookout was exhibiting the same possesive behavior as Holly but she was also chasing Beanbag and Echo away any time they tried to come near the front of the cage. We tried to squirt her a few times, but it didn’t really slow her down. Eventually Lookout got so upset that she was bullying Bean & Echo even when Cheyenne was nowhere near the cage. At that point, I took her out of the cage and spent the rest of Cheyenne’s romp time soothing her, telling her that I understood that she was doing her job and protecting her warren. Unfortunately with Lookout out of the cage “protecting the warren” suddenly became Echo’s job. Echo is a friendly and curious bun. She was very distressed by being responsible for the safety of the warren. But being next in the heirarchy meant that she was in charge while Lookout was away. It was obviously upsetting her. Rather than continue the cycle of upset, we decided it would be best to put Cheyenne back in her cage and let everyone calm down. Hopefully all of the rabbits will eventually become accustomed to each other’s smells (since they share the same romp space) and the territorial behavior will calm down as it did when we first brought Holly home. Till then, we’ve decided that when Cheyenne is given romp time we’ll confine the trio to the top 2 floors of their cage so they don’t get so upset by her invasion into “their space”. The Migratory Habits of the Urban Rabbit? Comments Off on The Migratory Habits of the Urban Rabbit? Beanbag’s favorite way to nap is to take a mid-morning and afternoon snooze in the sunshine in his litterbox full of hay. He tucks his paws in and snuggles down into the hay and puffs up his fur to catch the warmth of the sun. Our front room where the bunnies live is very sunny so his fur gets nice and toasty warm. His eyes close most of the way and his nose is still. His ears stay flat down against his head unless a noise catches his attention, then he’ll lift one ear and turn it toward the offending sound to see if he should bother caring enough to get up and investigate. Tapsi is a German bunny. I moved to Boston for a job last year. For the beginning I left my two bunnies Tapsi and Lopsi with my mother in Germany. I just wanted to get settled first. Unfortunately, Lopsi, who was a very cute Holland Lop, started getting heart problems. He just had very bad days and nobody really knew why. Suddenly, in May, after I was at home visiting, and preparing everything for their trip to Boston, he felt asleep and did not wake up any more. I was devastated. My vacation was over and had to leave back to Boston. I canceled the bunny Ticket with Pet Air, because I did not want Tapsi to fly as cargo all by herself. My mother was worried, because Tapsi did not eat for almost a week, but then she recovered. I knew that I had to wait over the summer until I could plan Tapsi’s flight as carry-on luggage, because it was just to hot outside (on both continents). My boyfriend volunteered to fly her over in September. So I bought a ticket for him and Tapsi (she counts as excess hand-luggage) with Delta from Frankfurt via New York to Boston for September 20th. Also, he regularly visited Tapsi at my mothers, just to play with her. She was very lonely. 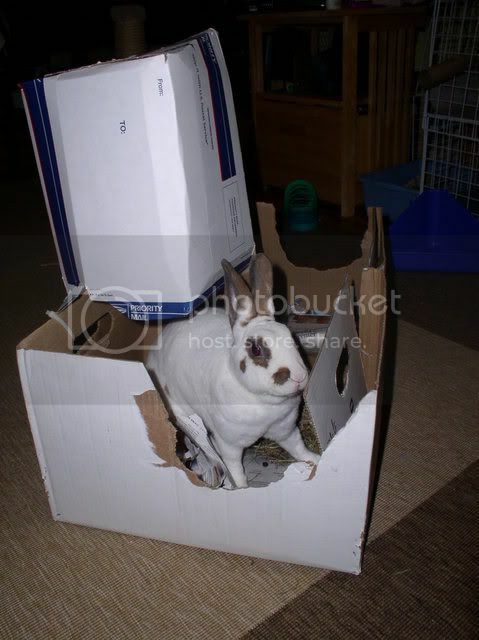 That time, in June, I had already seen Oliver’s picture on the House Rabbit Network Homepage. I knew, when nobody adopts him until Tapsi gets here, he will be her mate. First, I wanted to adopt and elderly bunny. Tapsi is eight and a baby would be nothing for her. Secondly, he has the same facial expression as Lopsi had, also being a slightly overweight Holland Lop. When September 20th was getting closer everybody was getting nervous. How will little Tapsi take the long trip (14 hours from door to door). She is this very tiny chinchilla colored Netherland Dwarf. We were equipped with about five different health certificates, three different containers and all kinds of medicine. Luckily, everything went very well. Delta Airlines was very friendly and nobody had an issue with the bunny. Tapsi mostly slept in her little Cabin Carrier on the seat next to my boyfriend (they had given him a seat with an empty seat next to him). In New York there was a misunderstanding about little Tapsi being a wild baby rabbit. That is just the way she looks. However, when my boyfriend showed him the Health Certificate with her picture, stating that she was an eight year old pet rabbit, she was all set to enter the United States of America. In New York I met them at the airport to fly on to Boston. Tapsi was very relaxed. In the middle of thousands of people waiting to board she was sitting in her carrier and chewing greens. For the last hour she was placed under the seat in front of us. We covered her with towels, so she did not get a cold. Arrived in Boston she was still chewing greens. In my apartment I introduced her to her new exercise pen. She ate right away. The first week she just had to fight her jet lag. She was hungry and up at very awkward times, but generally she adjusted very quickly. When two weeks were over, and Tapsi was doing great in her new home, I called the House Rabbit Network with the intention to adopt Oliver. I felt she was ready to be bonded again, after the lonely summer. The following Saturday Tapsi and I went to Suzanne’s home to meet Oliver (and all the other cute bunnies). In the “dating exercise pen” Tapsi and Oliver liked each other right away, just that Oliver liked her too much. He was very frisky and tempestuous. Too much for the little old lady. However, I decided to take him home. The love was basically there, it just needed some work. I had a large cage set up within Tapsi’s Exercise Pen, so they were separate, but could see each other. The second day I let them together. Oliver kept being frisky, but there were no fights. There were already times when he was grooming her. She enjoyed it. Occasionally it looked like she startled when she looked up, realizing that it was not her old friend Lopsi grooming her, but Oliver. Also, Oliver asked her to groom him. Something Lopsi never did. For the next week, I left them together during the day and separated them during nights. They were doing well and Oliver’s frisky behavior was diminishing. Oliver really enjoyed the good food and that he could run around. Tapsi enjoyed the new companion. After the work week was over, I decided, that they could finally be together. I allowed them to be together for 24 hours a day, and both of them are very happy. Tapsi decided that she wants to keep this cute little fellow. Hopefully he will stay with her with the rest of her life. I could not stand her being left alone again. I saw him in the Internet and felt in love with him for Tapsi. I was right: He is the type of bunny guy she likes. After a week he has learned to treat her like a lady.But also he encourages her to be more outgoing. Oliver enjoys his new live: eating greens with his companion, cuddling with her and exploring the big apartment we all live in.I would encourage everybody, who has an old widowed rabbit, to bond him/her again. Two unhappy bunnies are two happy one’s now. Sortly after adopting Oliver into her home, Corinna lost Tapsi to a sudden heart-attack. For the short few months that they were together, Oliver and Tapsi were very happy. Corinna often spoke of how Tapsi was acting like a younger bunny again because of Oliver’s company. Corinna plans to try to adopt a friend for Oliver from HRN after they’ve had some time to get over their loss.